Vilnius, LITHUANIA – The private tech company Communications of CARL AB announced today that they will supply the Lithuanian 112 (ERC) during an evaluation period with their cloud solution CARL. 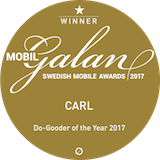 Communications of CARL is a privately owned Stockholm-based company that targets the public safety sector with innovate solutions. The company delivers a cloud based solution called CARL “Call And Rescue Link”. By establishing a link between the smartphones and CARL it can provide real-time data such as location, chat(RTT), SMS, images and live video when you need it the most without any apps.